In the framework of its efforts to improve the performance of the digital repository and its development, the Deanship of Libraries at the University of Gezira held’s on 10th of February a training course in practical scientific applications for archiving documents electronically in cooperation with El-Mesned Center for Training and Human Resources Development and sponsorship of the Digital Depository Committee and with the presence of the Dean of Students Affairs Dr. El Fatih El Kanani the representive of the deputy Vice Chancellor of the University, Dean of libraries. 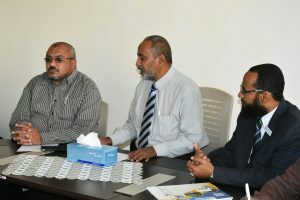 Dr Abu Obeida Hamouda and from the Center of Training and Human Resources development Ustaz .Haitham Al Azizi and a number of employees at the libraries administration. Dr. El Fatih-El Kinani expressed his happiness with this training course, praising with the effort exerted by the libraries administration in the Digital Depository and the work being done and praises with the development which the Digital Depository witness in downloading the data. He stressed the commitment of the University administration to the outputs of this training course. He also expressed his readiness to provide Sebil for the central library administration especially that the role of the Deanship of Students Affairs is characterized by complementary with all sectors and departments of the University. While dean of libraries Dr. Abu-Obaida Hamouda expressed His happiness with this training course and welcoming with the representive of the deputy Vice Chancellor of the University Dr. El-Fatih El- Kanani, Ustaz. Haythem Al-Azizi from El-Mesned Training Center and the members of the Digital Depository and he said that we hopes that this training course will be fruitful especially as we are in the second phase of the Digital Depository and we hope that we will benefit greatly. This second phase, which began with the implementation of this training course, aims to the photography of more than 7000 University papers in addition to a large number of conferences proceedings and other documents that were not limited. Ustaz. Haythem El-Azizi expressed his happiness with his participation in this training course and praised with University of Gezira for its development in all fields and efforts in implementing these fields, especially the work of the Digital Depository . El -Mesned center for training and human resources development is based on building a documentary society based on scientific and practical foundations. And its mission is the first specialized center in the management of documents and electronic archiving in accordance with international standards and scientific and practical experiences using the latest means and techniques.